Murphy & Company is pleased to welcome Stephanie Wong to the firm. Stephanie is a young lawyer with a passion for working with small businesses and entrepreneurs, particularly food enterprises, artisan producers and technology start-ups. She primarily advises on corporate-commercial law, real estate transactions and will and estates. 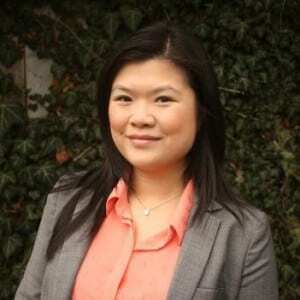 Stephanie was born and raised in East Vancouver, British Columbia. After graduating from Killarney Secondary School, she enrolled in the Faculty of Arts at the University of British Columbia. There, Stephanie completed the Arts One program, which led her to pursue a Bachelor of Arts majoring in Honours English Literature and Classical Studies. With this degree in hand, Stephanie moved across the country to attend the Schulich School of Law at Dalhousie University, in Halifax Nova Scotia. After her first year at Dalhousie, she had the opportunity to spend a summer at Queen’s University, at their acclaimed Bader International Study Centre at Herstmonceux Castle in the United Kingdom, from which she obtained a Certificate in International Business Law. After completing her first two years at Dalhousie, Stephanie returned to Vancouver to complete the last year of her Juris Doctor degree as a visiting student at the University of British Columbia. Since then, Stephanie has resided in a charming three-story walk up in the Mount Pleasant neighbourhood, with her yellow road cruiser bicycle and two large cats. In her free time, Stephanie volunteers with BC Children’s Hospital Foundation and the Vancouver Orphan Kitten Rescue Association. You can reach Stephanie by email at: swong@murphyandcompany.com, or by telephone at: (800) 708-3884.